They said he had the right bloodlines, that his father had been one of them before him. And that, they all agreed, was important. This was how a group of mobsters, meeting over lunch at a restaurant in Kenilworth three years ago, described Nicholas “Nicky Skins” Stefanelli, a soldier in the Gambino crime family who was sitting with them that day. “If you don’t know the families, the grandmothers, the grandfathers, forget it,” said Joseph “Scoops” Licata, a capo who ran a North Jersey crew for the Philadelphia mob. 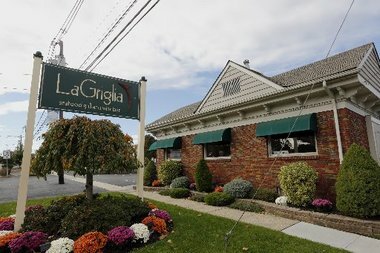 They were at a table in a corner of the main dining room at LaGriglia, a small, classy restaurant just off the Garden State Parkway. This was in May of 2010. Ten mobsters from Philadelphia, New Jersey and New York broke bread for more than four hours that day. They talked about business and history, laughing and joking about who they knew and what they had done. A federal prosecutor would later call it a meeting of the “board of directors” of organized crime, pointing out that the participants included leaders of both the Gambino crime family and the Philadelphia branch of Cosa Nostra. Defense attorneys would argue that it was just a group of friends having lunch and talking about the old days. The one thing no one could dispute was that “Nicky Skins” was one of the guys at the table. The “good man” who the other mobsters praised, was, in fact, their worst nightmare. He was a wiseguy wearing a wire. The tape from the LaGriglia meeting was one of dozens Stefanelli made for the FBI during a two-year period beginning in 2009. Large portions of it were played at a trial in Philadelphia last year along with tapes from a meeting at the American Bistro in Nutley. Other Stefanelli tapes were evidence in a case in Providence, R.I., that ended with a guilty plea from a high-ranking mob figure. More tapes are sitting in the offices of federal prosecutors in Newark and New York, verbal time bombs waiting to go off in other cases that are still being built. They are the legacy of Nicky Skins Stefanelli who committed suicide in February 2012 at age 69 rather than take the witness stand. The tapes speak volumes about the fractured state of the mob in New Jersey, a once-fertile breeding ground for organized crime where members of seven mob families conducted business. Now, it’s all come undone. What’s happened to the mob in New Jersey is a microcosm of what’s happened to the mob across America. The once-secret society is no more. Omerta, the code of silence, has been shattered again and again. Goodfellas don't sue goodfellas. Goodfellas kill goodfellas.That's just the way it is." Tougher racketeering laws, high tech electronic surveillance and the natural progression of the Italian-American immigrant experience have all contributed. The fact is the best and the brightest in the Italian-American community are now doctors, lawyers, engineers and educators. Pick any profession or any field of endeavor and you’ll find someone whose name ends in a vowel at or near the top of the list. Second- and third-generation gangsters lack the grit, the style, the savvy and, most importantly, the intelligence, of their forefathers. The mob is scraping the bottom of the gene pool. The tape from the LaGriglia meeting was one of the dozens Stefanelli made for the FBI during a two-year period beginning in 2009. Cooperating witnesses and the multi-pronged prosecution hammer that is the Racketeer Influenced and Corrupt Organizations (RICO) Act have decimated the American Mafia. Cosa Nostra is a shell of what it once was. “Men of Honor” is a term that hardly applies. The only people making offers that can’t be refused are FBI agents and book publishers. Mobsters all over the country have been rushing to the witness stand and to their literary agents to make deals. Sammy “The Bull” Gravano, Alphonse “Little Al” D’Arco, Ralph Natale, Philip “Crazy Phil” Leonetti, Anthony “Tumac” Accetturo, the list goes on and on and on. Nowhere is the phenomenon more obvious than in New Jersey. And ironically, the wiseguys sitting at the table at LaGriglia, most of them in their 60s and 70s, were well aware of it . “We still gotta stay with the old rules,” said Licata. “Only way to survive,” said Gambino. “Brotherhood,” said Gambino crime family soldier Alphonse Trucchio, completing Fazzini’s thought. “That’s the problem, f------ greed,” said Stefanelli as the body wire he was wearing picked up every word he and the others said that day. It is hard to imagine that anyone sitting at the table that afternoon would have pegged Nicky Skins as an underworld Judas. Stefanelli had been around for years. The Newark-Belleville area where he grew up was a wiseguy paradise in the 1960s and 1970s. Members of the five New York families, as well as the indigenous DeCavalcante Family (the New Jersey mob family on whom “The Sopranos” was based) and a crew from the Philadelphia mob, all had action on the streets. They ran craps games, took sports bets, loaned money and dealt in stolen property. Everybody knew somebody who was “connected.” It was a neighborhood thing. Stefanelli first showed up on law enforcement’s radar as a young member of a mob-connected burglary crew, Carroll says. Over the years, he graduated to gambling, loan-sharking, extortion, drugs and murder. He ran with some genuine tough guys, violent mobsters, guys such as Robert “Bobby Cabert” Bisaccia and another gangster whose nickname was “The Vulture,” says Carroll. But Skins had a softer edge. Which, clearly, was a rhetorical question. Stefanelli had a lengthy criminal record. His most serious bust came in 1994 for dealing in cocaine and heroin. He pleaded guilty in 1996 and did several years in federal prison. But he didn’t miss a beat when he returned to the streets, gravitating toward the Gambino crime family and an assortment of mob gambits. His Gambino connections were in New York, where authorities say he was formally initiated into the mob, becoming a soldier who had access to some of the major players in the organization. As a jack-of-all-trades in the underworld, and always looking for opportunities, he moved up and down the East Coast as a Gambino crime family representative, a position that made him even more valuable when the FBI flipped him in 2009. "The feds sent him ('Nicky Skins') down here to set me up," says Joseph 'Skinny Joe' Merlino, head of the Philadelphia mob. "I told him, **** legitimate. I don't want nothing to do with any of that other stuff.' What else could I say? That, according to several sources, was Stefanelli. The tape, according to the indictment, includes a conversation in which DiNunzio identifies himself as a leader of the New England mob and discusses extortion gambits in which he and others were involved. Philadelphia mob leader Joseph “Skinny Joey” Merlino, who moved to Florida after his release from prison in 2011, also was picked up on a Stefanelli tape made a few weeks after Skins’ encounter with DeNunzio. Merlino says he was introduced to Stefanelli by a North Jersey attorney. Ever cautious, Merlino says he steered away from any discussion about mob activities and learned later that Stefanelli was wired during their meeting at a Dunkin’ Donuts in Boca Raton. While that tape, like the DeNunzio tape, has never been played in public, defense attorneys in the retrial of Philadelphia mob boss Joseph “Uncle Joe” Ligambi and his nephew, mobster George Borgesi, received court authorization to listen to it. They are trying to determine if the conversation, in which Merlino disavows any mob connections and says there is little if anything happening in the Philadelphia underworld, will help undermine the racketeering conspiracy charges that Ligambi and Borgesi face. But it is the LaGriglia tape, prosecutors say, that best supports the conspiracy charge and clearly demonstrates the existence of the mob. Ligambi, Licata, Fazzini and Anthony Staino were the Philadelphia representatives at the LaGriglia meeting. The Gambinos were represented by the brothers Joe and John Gambino, Stefanelli, Trucchio, Lorenzo Mannino and Michael Roccaforte. The mobsters ate and drank for nearly five hours that afternoon. The entrees included Chilean sea bass, yellow fin tuna, filet mignon and chicken with broccoli rabe. Seafood salad and calamari were among the appetizers. The desserts included fresh berries and cheesecake. It was all washed down with four bottles of a nice red Mocali and a $200 bottle of Biondi Santi. The total bill came to $902, not counting the tip. But with the tape and potential indictments hanging over their heads, the lunch may prove to be a lot more expensive. Everyone was picked up on the wire. The discussions ranged from talk of past mob hits and money-making plots to an ongoing dispute between the Philadelphia mob and members of the Lucchese crime family, who were apparently trying to make inroads into South Jersey where the Philadelphia mob held sway. There was also plenty of laughing and joking and talk about the old — and better — days. Licata, speaking partly in Italian, offered a toast at one point and everyone raised their glasses. "To everybody’s health," the then 68-year-old mob capo said with a smile. "All the good guys. Anywhere … The good guys." ‘It used to be, if you went into a meeting with a dozen guys, whatever was said in that meeting would never get out," says Danny Provenzano. "Now half of those guys would be informants and two or three of them would be wearing wires." That, he says, is the state of the American Mafia. Like Merlino, Provenzano says, he has turned in another direction after serving most of a seven-year state sentence for racketeering. You just can’t trust anyone anymore, said the 50-year-old aspiring actor and director whose great uncle was Anthony "Tony Pro" Provenzano. Tony Pro, who with his brothers ran the notorious Teamsters Local 560 out of Union City, was a Genovese crime family capo and a prime suspect in the alledged murder and disappearance of Jimmy Hoffa. Hoffa disappeared in 1975. The fact that no one has ever been charged and his body has never been recovered speaks to the old ways of the Mafia. If something like that happened today, one source quipped, you’d be watching video of the body disposal on YouTube. Stefanelli came from the old world, but apparently got caught in the switches of time. While the exact details of his decision to cooperate have never been made public, the conventional wisdom in underworld, law enforcement and defense attorney circles is that Skins got jammed up again around 2009 in a drug case. And in order to get out from under it and to protect his son, Nicky Jr., who also might have been charged, Skins cut a deal and agreed to wear a wire for the FBI. It was a classic law enforcement move. You help us, we’ll help you. His tapes are now part of an ever-expanding audio history of the mob in New Jersey. In 1989, George Fresolone, a Newark-area mob associate working with the North Jersey branch of the Philadelphia mob, wore a wire for a year for the New Jersey State Police. Operation Broadsword, the name of the investigation, resulted in the indictments of 41 mob members and associates from six crime families in the Garden State. Forty of the 41 defendants pleaded guilty rather than go to trial. The 41st was convicted by a jury. Recordings make devastating pieces of evidence. "You can’t cross-examine a tape," says one defense attorney. Fresolone wore a body wire to his own mob initiation ceremony, the ultimate rejection of the code of silence and men-of-honor mystique that had long surrounded the American Mafia. A few years later, the feds placed electronic listening devices in the Camden law office of Salvatore Avena, the longtime criminal defence attorney for Philadelphia mob boss John Stanfa. Authorities convinced a judge to approve the bugging, arguing that Stanfa held secret mob meetings in the office suite, believing lawyer-client privilege would protect him. The taping, which went on for two years, presented investigators with a treasure trove of information and enough dialogue to fill a season of "Sopranos" episodes. "You know what I’ll do, I’ll get a knife … I’ll cut out his tongue and we’ll send it to the wife," Stanfa said in one conversation in which he plotted the gruesome murder of a rival. "We put it in an envelope. Put a stamp on it." Avena was indicted with Stanfa and two dozen others in 1994 on racketerring charges built in large part around evidence gathered from the electronic bugs planted in his office. He was found not guilty during a trial in 1996. Profaci, his thick New York accent bouncing off the walls, was picked up in nearly a dozen conversations counseling Avena to drop the suit. But it was one line — a line that Mario Puzo couldn’t have written any better and that Robert De Niro couldn’t have delivered with more feeling — that succinctly explained the dilemma. "Sal, you don’t understand," Profaci told Avena. "Goodfellas don’t sue goodfellas. Goodfellas kill goodfellas. That’s just the way it is." That investigation ended with convictions of more than 25 mob members and associates. Stanfa is now serving five consecutive life terms. But even as it was ending, the feds were bugging the phones, meeting places and penthouse apartment of Pennsauken-based mob boss Ralph Natale, who had succeeded Stanfa. Those tapes were followed by hundreds of conversations picked up on a body wire worn by "Big Ron" Previte, a Hammonton mobster who, like Stefanelli, wore a wire for the FBI for two years. Secretly recorded conversations are now a standard part of the Justice Department playbook in its war on organized crime. On any given day in any city where the American Mafia is doing business, it’s a good bet there is at least one wiseguy wired for sound. Nowhere has that proven more effective than in New Jersey. But somewhere along the way someone either wasn’t watching or missed some signals that Stefanelli was sending out. "You can’t really know what it’s like (to wear a wire) unless you’ve done it," says Steven Lenehan, a former mob associate from North Jersey who did just that and is now living with a new name in another part of the country. Lenehan, who wore a wire for the feds for two years in the early 1990s, went one step further than Stefanelli, testifying for the prosecution. His testimony helped the government win two dozen convictions. Taking the witness stand was a move that Stefanelli apparently decided he couldn’t make. Lenehan says he understands the internal turmoil — the guilt, the angst and the self-loathing. "There were times I felt like killing myself because of what I had done," Lenehan said in a phone interview from another part of the country where he has reinvented himself. "Cooperating, being ‘a rat,’ is something you never think you’re going to do." Lenehan frankly admits that he misses the old life — the money, the status, the network of friends and associates all living in that same insular underworld. He would love to return to Bloomfield Avenue in Newark and have a drink in the Belmont Tavern or any one of the other bars and social clubs that were, and he believes still are, wiseguy hangouts. "I can’t go back, I realize that," he says. "I made a choice. Nicky Skins was in that same situation. He chose to handle it differently." Skins, in fact, went out with a bang. On Feb. 24, 2012, Stefanelli walked into Phoenix Amusement, a video poker and game machine distributorship on Floyd Avenue in Bloomfield owned by Joseph Rossi. Skins pumped two bullets into Rossi’s head, killing him. Stefanelli, who according to several reports had already arranged and paid for his own funeral, then checked into the Renaissance Meadowlands Hotel. Two days later, he was found dead of a drug overdose. Few other details have been provided by investigators. Rossi’s brother, Anthony, the executor of Joseph Rossi’s will, has hired an attorney who is seeking details from the FBI and local police. Among other things, the Rossi family wants to know how much, if any, protection the feds were providing Joseph Rossi, who was apparently cooperating in an ongoing mob investigation centered in part around the mob’s operation of illegal video poker machines. On the flip side of the murder equation, Steven Dratch, the lawyer for the Rossi estate, says he is also trying to determine how well the feds were monitoring Stefanelli. "Right now, we have more questions than answers," says Dratch. "We may have to file suit," (against the federal government), says Anthony Rossi. According to several sources, Stefanelli believed that Joseph Rossi had fingered him in the 2009 drug case that led to him becoming a cooperator. Revenge and then suicide, that’s the way Nicky Skins decided to go out. What’s left, in addition to grieving family members looking for answers, are the tapes. Nicky Skins worked for the FBI for two years. So far, the only cases in which his tapes have been used are in Philadelphia and Providence, R.I. There are many more tapes and, most observers believe, there will be more cases. Today in New York and New Jersey, there are dozens of mobsters waiting and wondering. They have two questions: "What did I say to Nicky Skins?" and "Was he wearing a wire when I said it?"